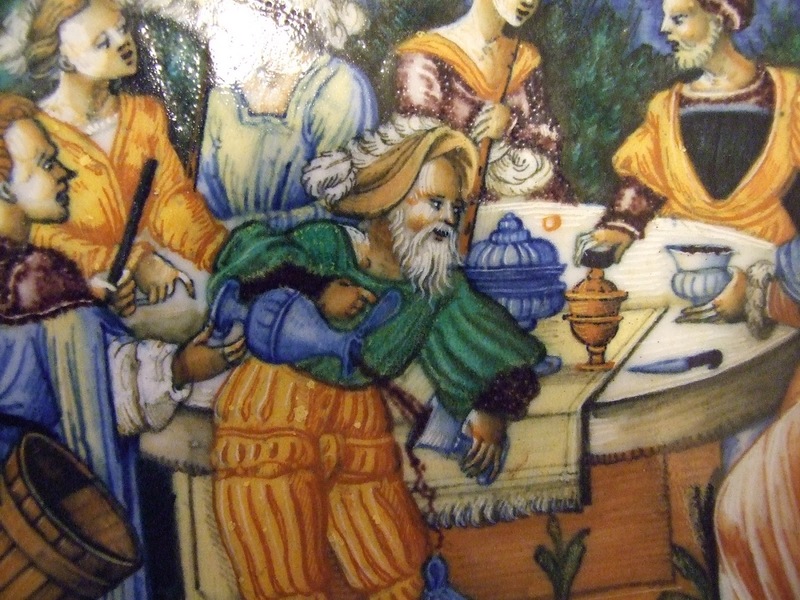 A woman in Somerset, England, discovered she had a rare Italian Renaissance Maiolica plate hanging on the wall of her cottage when she invited appraiser Richard Bromell of Charterhouse Auctioneers in Sherborne, Dorset, to assess some of the objects in her home for their market value. It was hanging in a makeshift wire frame behind a door that was always open. Only about two inches of it were visible when Bromwell caught a glimpse of it. 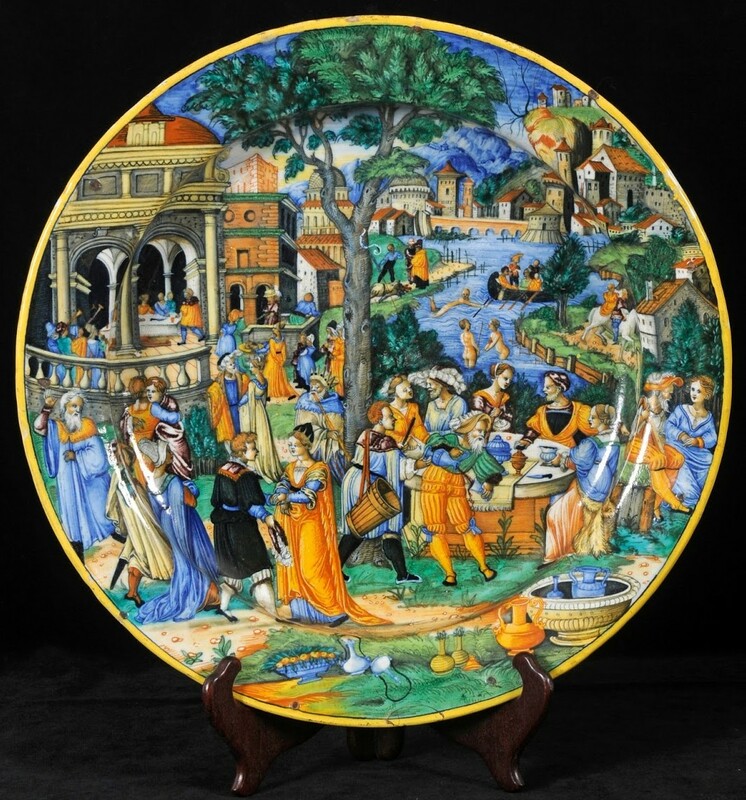 At first he thought it had to be a 19th century reproduction worth perhaps £2,000 ($3,100), but when he took it to experts at the Ashmolean Museum they confirmed that it was the real thing: a Maiolica charger made in Urbino around 1540. 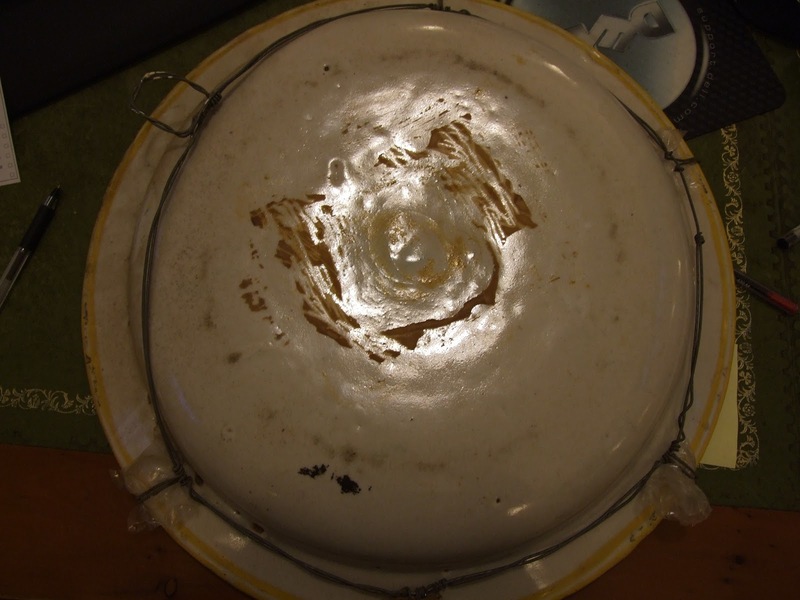 The owner had inherited it from a relative years ago and had no idea of its age or value. It was put up for auction at Charterhouse on February 14th with a pre-sale estimate of £100,000 ($155,000), but due to massive interest from bidders all over Europe and the US, the final hammer price was an astonishing £567,000 ($880,000). It’s the condition and quality of the painting that made the market salivate. 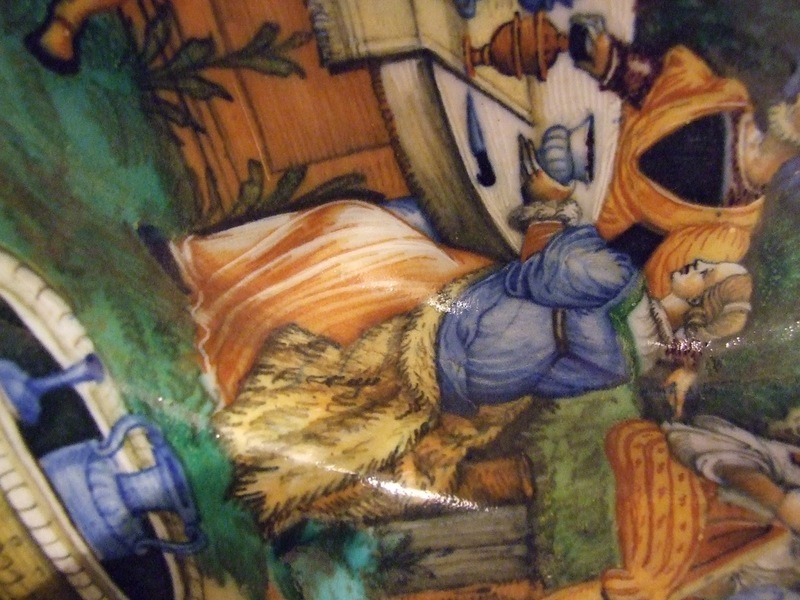 The dish is nearly 500 years old, but the colors are still brilliant and the finish glossy. The only damage was a repaired chip about 1.4 inches wide on the bottom of the charger. It’s barely noticeable and doesn’t overlap with any of the figures, just with the yellow border and a green scribble of grass. The plate is 16 inches in diameter and painted in a style called istoriato, an elaborate, highly detailed scene from history or legend. 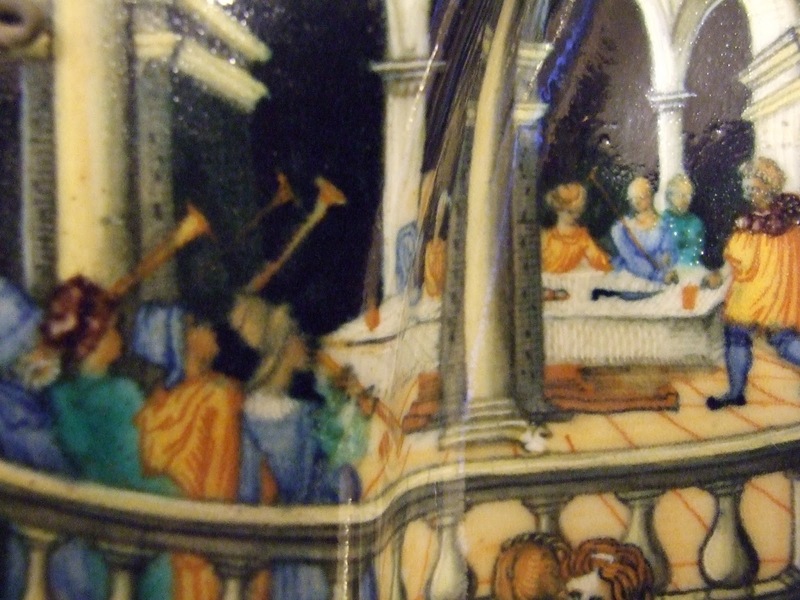 The subject on this piece is the Feast of Herod, although it takes a little looking to see it. Herod and his wife sit at a table under the columned portico in the left background. Walking up the steps towards them is Salome and some ladies carrying the head of John the Baptist on a platter. 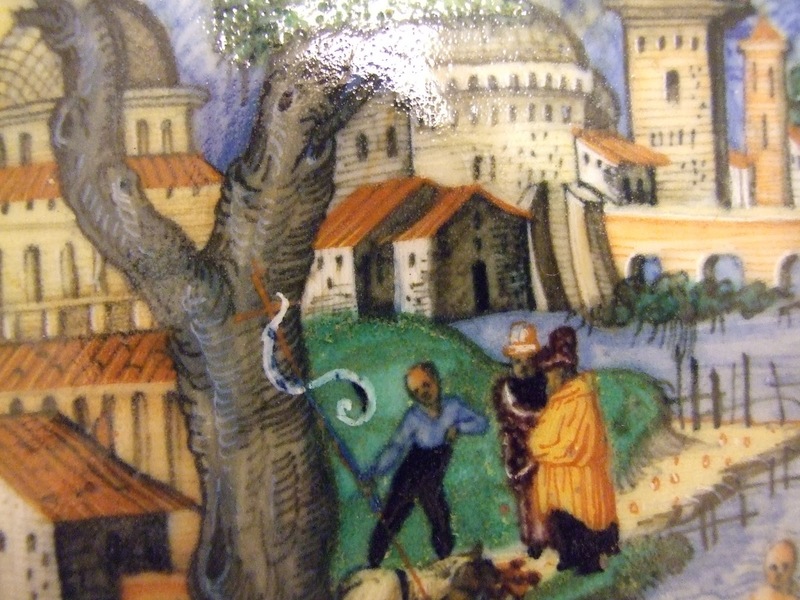 In the center background between the upper tree trunk on the left and the riverbank on the right is the executioner standing next to John’s headless body. 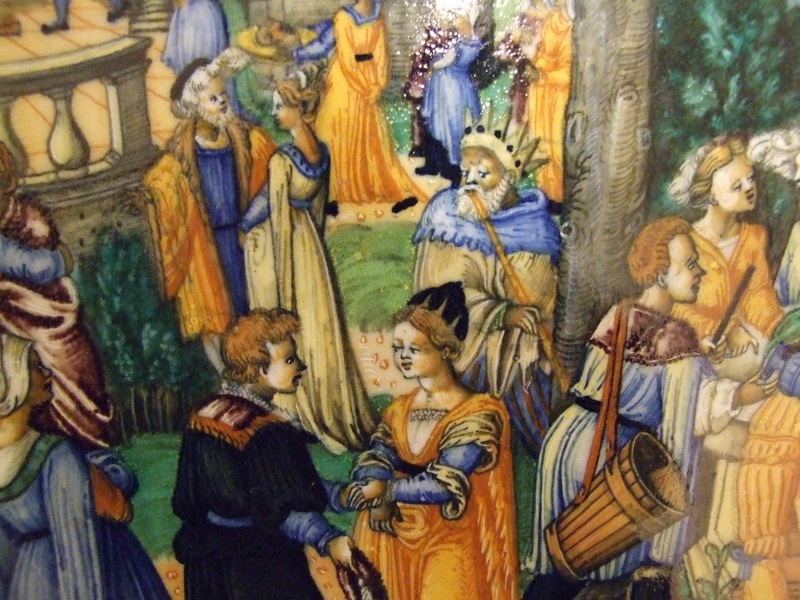 The rest of the scene is populated by wealthy revelers banqueting front and center, musicians to the left of them, ladies dancing to the left of the musicians, skinny dippers in the river on the right and a townscape in the back. 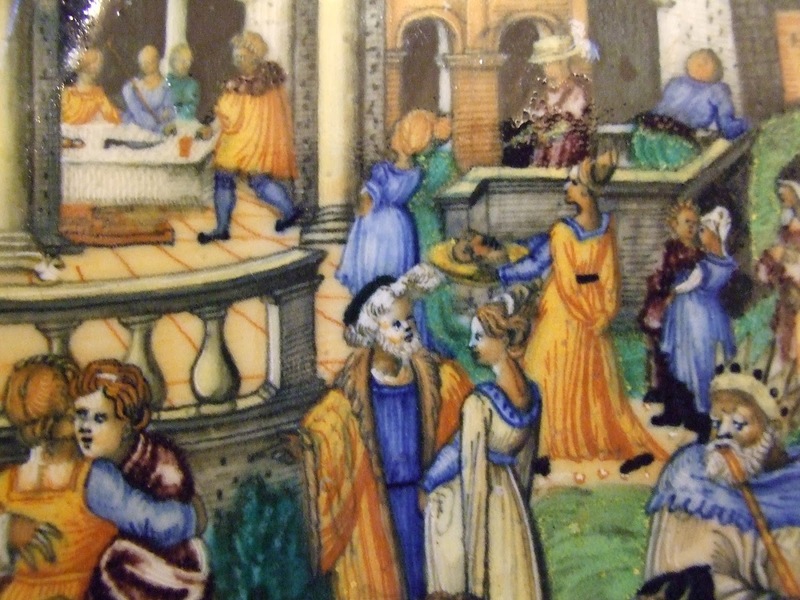 It’s a big ol’ Renaissance party that could be set in any hilly town in Europe. One extra special touch is a hint of what may be the painter’s name hidden in the fur stole of the woman sitting on the right side of the central foreground banqueting table. 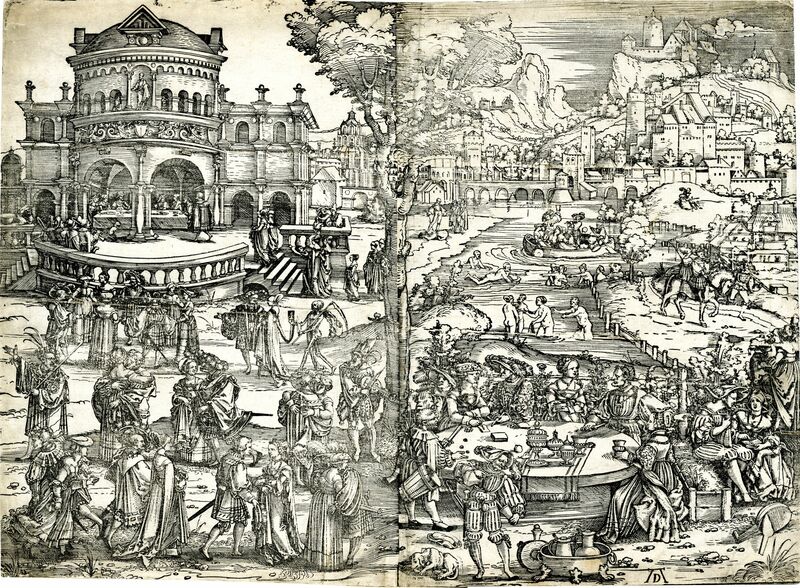 The design is a version of The Feast of Herod, a woodcut by German printmaker Sebald Beham dating to 1525-1545. The maiolica version leaves out the figure of death of holding a scythe who follows a couple walking just beneath Salome and John’s head. The architecture and overall scene is compressed to fit onto a plate, but other than those changes and the marvelous addition of color, it’s a faithful rendition. This entry was posted on Sunday, February 17th, 2013 at 11:16 PM	and is filed under Renaissance, Treasures. You can follow any responses to this entry through the RSS 2.0 feed. You can skip to the end and leave a response. Pinging is currently not allowed. WOW ! WHAT A FIND.I love these chargers and like the Delft chargers are so rare.I have seen both while attending Henry Sandon’s classes who was the curator of Worcester Porcelain England.What a lovely surprise for that lady who had inherited the charger.Many thanks for this post it was a delight for me to read. Those classes must have been wonderful. I’ve seen him many a time on the original Antiques Roadshow and he is a one-man encyclopedia of porcelain knowledge. Just curious. On the woodprint, center bottom, there appears to be two initials, an “A” over a “D”. Is that Albrecht Durer’s signature. Maybe I have my dates wrong. If not, it could be attributed to him near the end of his life. Excellent catch. That is very, very close to Dürer’s signature, a clear copy thereof, in fact, albeit missing the crossbar of the A. It’s probably a later addition, as several of Sebald Beham’s works, some of them directly inspired by Dürer pieces, were attributed to AD after his death. This earlier impression of the Feast of Herod does not have the fake AD mark. 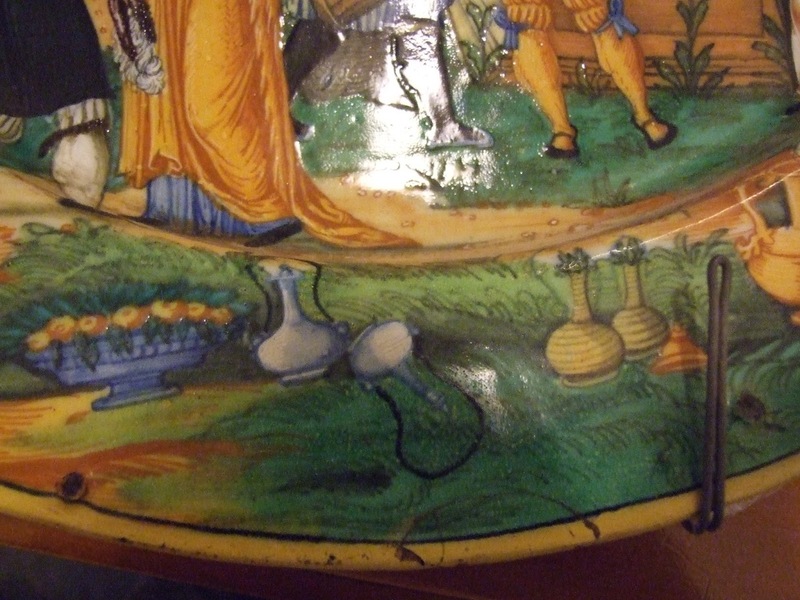 It probably does not really count here, but my very own grandmom has a maiolica plate with a rabbit and an “A” and a “D”, and to attribute the woodcut to Albrecht seems at least reasonable to me. He probably did not take his woodcuts to his grave, and after all its all craftsmanship, isn’t it ? The earlier impression of the ‘Feast of Herod’ does indeed not have the AD mark, but it comes up instead with a little copyright notice: “By the favour and privilege of his Imperial Majesty, let no one dare to print this work under penalty of payment of ten marks of pure gold. Albrecht Glockendon Illuminist of Nuremberg”. 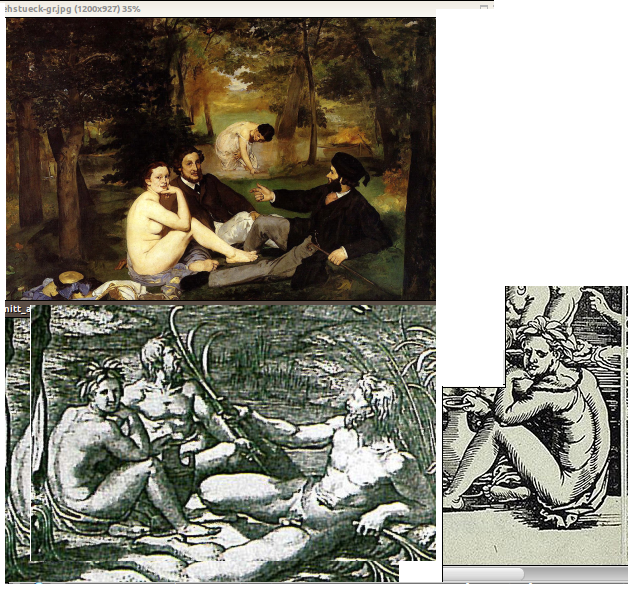 What about a little mash-up now of Marcantonio Raimondi, Manet and our Mr. Beham remixing each other ? Thanks! I am impressed with the resources you have at hand, so comprehensive! The guy from ‘The Scream’ is skinny dipping! This is off topic but I need to say it: I really love your blog. I read it daily, and while specific topics may interest a tad less than others (personally), I love the passion and enthusiasm you have. Love this. 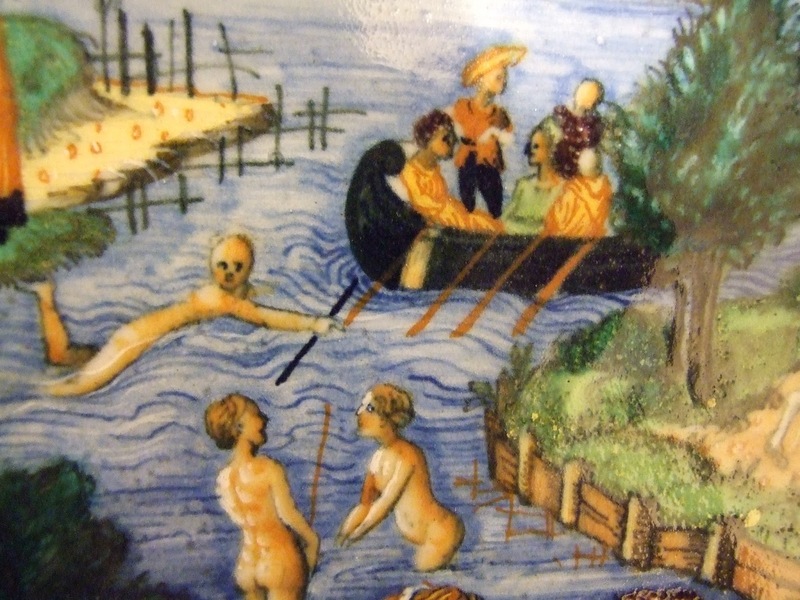 Is it just me, or is that a classics macabre swimming in the river? The amount of detail done on the others makes this seem intentional to me. Ooh, good catch! It could very well be.